Movie Review - Blue Jasmine - 'Blue' Rhapsodies: Woody Allen, In Need Of New Tricks Blue Jasmine finds the filmmaker stuck in old ruts; though his technique is as sound as ever, his worldview seems to have congealed decades ago. Cate Blanchett, Sally Hawkins and Alec Baldwin star in a story inspired by Bernie Madoff and Blanche DuBois. 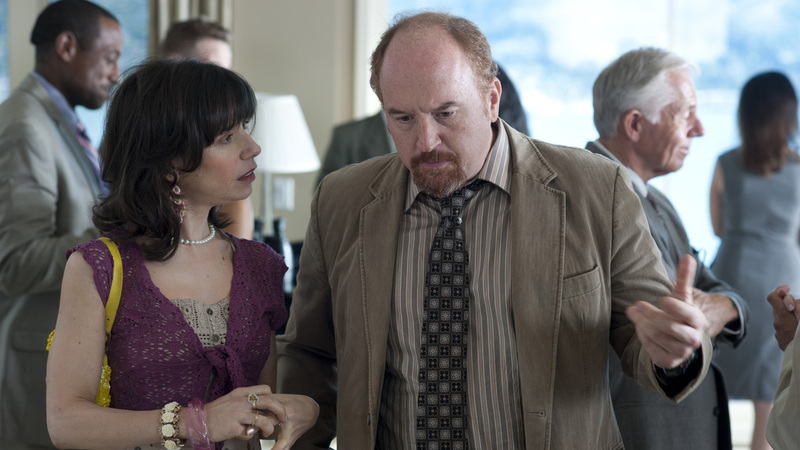 Ginger's (Sally Hawkins) best moments happen while in the company of a persistent suitor named Al (Louis C.K.). Another year, another Woody Allen picture, and few agree on whether that's a good thing. For some, he hasn't made an interesting film since Husbands and Wives, maybe even Hannah and Her Sisters. Others think more recent morality plays like Match Point and comic parables like Midnight in Paris prove the old dog still hunts. I'm in the middle. I'm amazed he makes films like Blue Jasmine seem fresh and lively when he works in such a closed creative ecosystem — in which no music seems to have penetrated his consciousness in any meaningful way since the jazz of the '50s, no theater since early Arthur Miller and Tennessee Williams, and no movies since Ingmar Bergman's Cries and Whispers in 1972. More damaging to his work is his congealed worldview. Long ago Allen concluded the universe was godless, justice-less, and meaningless. The best we can do is eke out our hopeless lives with, as he titled one of his movie, whatever works. In her prime, Jasmine (Cate Blanchett) could be found curled up with a book on the deck with Hal (Alec Baldwin). That all came crashing down with news of Hal's infidelity and their subsequent divorce. Here's what still works for Allen: filmmaking. He continues to refine his technique. His movies are lighter, leaner, more fluid. Blue Jasmine is sour and derivative, but he sells it beautifully. He does read newspapers, and in interviews expresses strong opinions about the unscrupulousness of Wall Street titans. In Blue Jasmine, he makes his protagonist a kind of younger Ruth Madoff, wife of swindler Bernie, and sets her down in an updated A Streetcar Named Desire. Cate Blanchett plays Jasmine, once wealthy and ensconced in New York society, now broke — and forced to travel to San Francisco and live with her working-class sister, Ginger, played by Sally Hawkins. They were adopted, and there's quite a gap in their styles. When Jasmine isn't insulting Ginger's blue-collar boyfriend, played by Bobby Cannavale, she's swallowing tranquilizers and going in and out of fugue states, babbling to anyone and no one while Allen whisks us back in time to life with her ex-husband, played by Alec Baldwin. I don't think Allen identifies with Jasmine the way Tennessee Williams did with Blanche. He clearly hates her. She didn't know her husband was defrauding investors, but only because she didn't want to — not with shopping and Pilates and all those charity events. Calamity hasn't made her a better person. That Blanchett played Blanche DuBois onstage is a mixed blessing. I found her too theatrical, too external: I wanted a grittier actress. But Blanchett does carry scenes that would trip up a less able performer, and she's a terrific physical comedian. In flashbacks, when Jasmine is living high, her posture — the uptilt of her head, the precision with which she holds her designer purse — is amusingly studied, as if she'd trained to be an Upper East Side trophy wife. If you know Allen's work or A Streetcar Named Desire, you can predict almost every turn and twist of Blue Jasmine. But Baldwin, plus Michael Stuhlbarg as a schnooky dentist and Andrew Dice Clay as Ginger's ex-husband, add deep and surprising shadings to their stereotypes. And you can never predict Sally Hawkins, best known as Poppy in Mike Leigh's Happy-Go-Lucky. She's Blanchett's opposite — raw, goosey, spontaneous. Her best scenes are with a persistent suitor played by Louis C.K., a sensitive actor even with lines he didn't write. But I wish he'd re-written them: They end at the point where in his own TV show, Louie, they'd mushroom into something more poetic and cringeworthy and revelatory. In interviews, Louis C.K. has said he'd like to co-write a film with Allen; I say, "Go for it!" I don't think Allen is too old to relearn what in his best work he showed artists like Louis C.K. : that even ordinary people have the capacity to transcend their worst instincts and awful surroundings. And that you don't have to settle for whatever works.